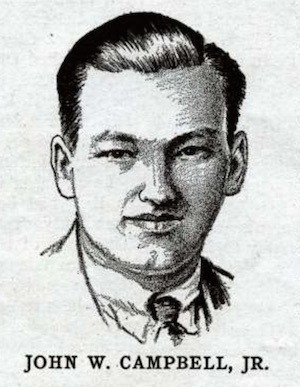 John W. Campbell was born in 1910; he died in 1971. He received a degree in Physics from MIT in 1923, publishing his first stories when still a student. In 1937 he became editor of Astounding Stories and discovered many great talents of sf, including Asimov, Heinlein, Sturgeon, van Vogt and others. He freely offered his ideas to his writers; Isaac Asimov has credited Campbell with the Three Laws of Robotics.